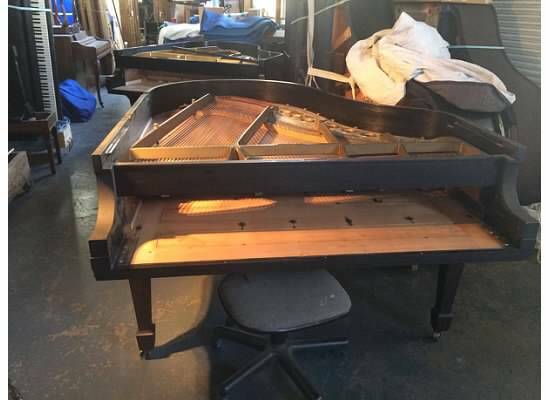 After over a year of looking for a Steinway grand piano, I finally found "my baby" while looking through a huge row of covered pianos on their sides at JB Piano, in San Rafael. 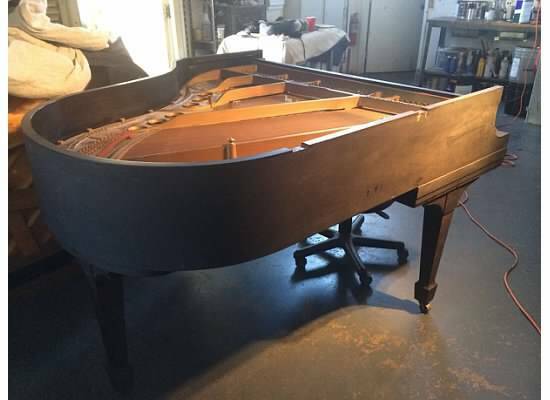 Glenn, the owner of JB Piano, in San Rafael, knew I was looking for a "M" (the "M" designates a Steinway grand piano model that is 5'7" in length) and I wanted one dating from the 1920's - which many consider to be the golden years of Steinway's manufacturing. I wanted an M because it is on the smaller side (but not the smallest), so if I were to ever move to a new house, the piano had a better chance of fitting in wherever we would be. While we were walking through the back of his warehouse, looking at all the pianos, Glenn pulled one out and I immediately knew it was mine. It looked neglected and a wreck, with a crackled finish, lots of dust and cobwebs - but the ivory keys were in great shape and the soundboard looked to be in perfect condition, with no cracks. 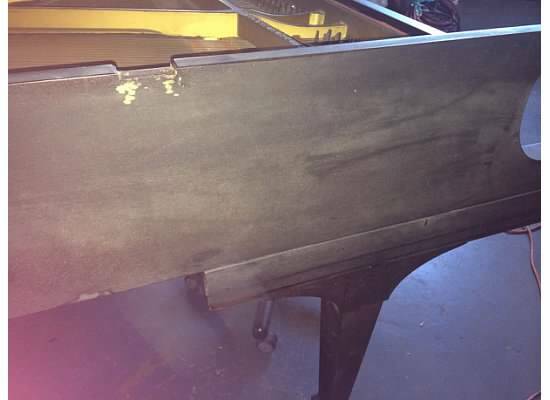 And, after seeing what Glenn has achieved with other pianos in way worse shape, I agreed to buy it on approval. Which means, I paid a deposit and when the piano is finished being restored, I could choose to pay the balance and buy the piano or my deposit would be refunded. Here is the piano during my first visit after restoration work began. In the 2nd photo below, you can almost see the small cracking in the finish. It felt rough when I rubbed my hands over the finish. 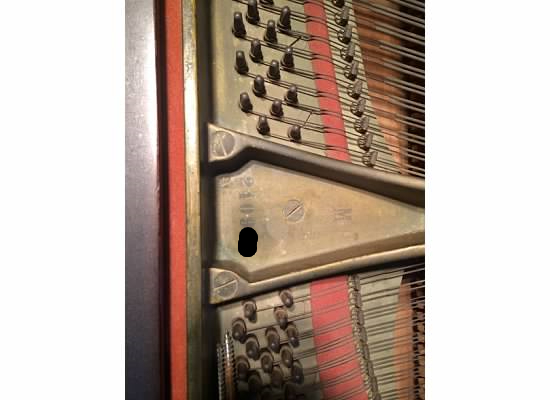 Here's a picture of the cast plate with the piano model number (M) and the serial number. The first 2 digits designate the year of manufacture. Although the number looks like it might say 21, in person you can see it is a 24, which is for the year 1926. I felt a little weird putting the whole serial number out on the internet, so I blocked off the last 2 numbers. You can see how dirty & dusty & rusty the strings and pins are. On my next visit, the piano was in the laquer room and was getting it's beauty treatment. The strings are off and the harp is going to get it's beauty treatment, next. Here's the harp on it's side. 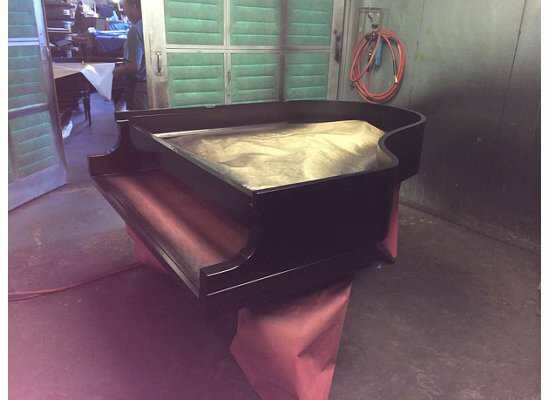 At my next visit, the piano case was done! There is Ramon, who does all the work on the cases - a true artist who takes pride in his work. 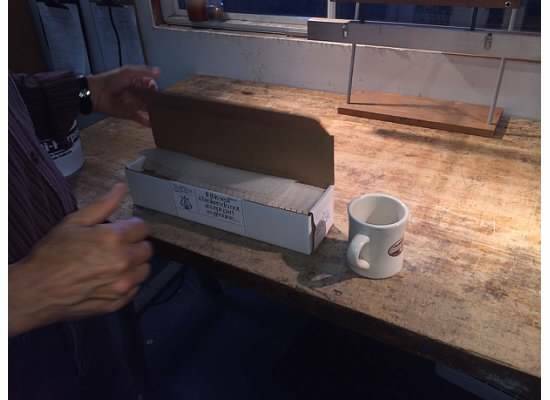 I took a picture of the hammers from Steinway - the action will be worked on this week. Here's my piano on delivery day! Here it is tied in the truck. Mark,Thomas and the piano coming down on the hydraulic lift gate. In the photo below. 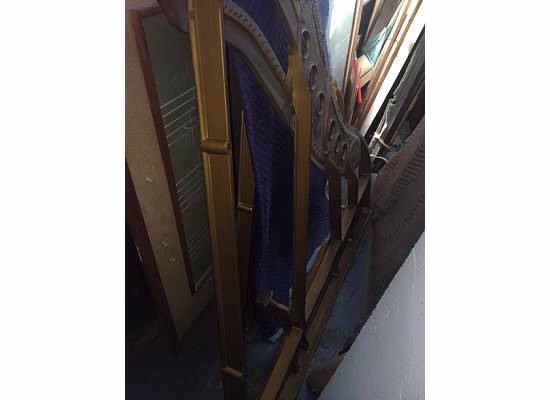 Mark and Thomas have put 2 legs on the piano and are using the "horse," which is a metal contraption that looks homemade that they use to lever the piano into a level position. They will then add the 3rd piano leg. Here it is all set up! It sounds amazing! You might wonder what the gold-colored thing is on the strings. It's a string cover! Keeps the dust and moisture out so the harp, strings, soundboard, etc. stay in great shape. Mark, the owner of Viking Piano Movers is professional, punctual and fun. After seeing their expertise, I wouldn't have another piano mover move my piano. The store where I purchased my piano says that Viking has never had a problem moving a piano for them. And, here's an unsolicited (and unpaid!) plug for Glenn at JB Piano, in San Rafael. Glenn has been truly fabulous to work with. He has spent hours educating me on not only how pianos work and are made, but gives very good customer service. 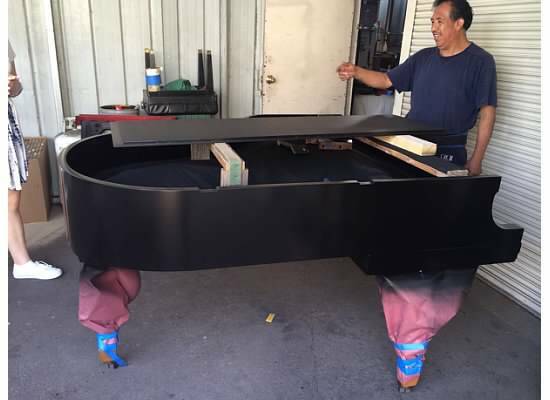 He specializes in grand piano sales (both new and used) and restoration. If you are looking for a grand piano, I would highly recommend you give Glenn a call.